When I was in Year 12 in 1982 I lived with my Grandparents in a Western Australian country town. My own bicycle had been recently stolen so I borrowed my Grandfather's old push bike to ride to school each day. His bike was an old steel men's bike with 28 inch wheels that had a back pedal coaster brake. It was a fantastic old bike. The most memorable thing about the bike was that it had an old leather saddle. I don't know what brand of saddle it was, but the experience made me fall in love with leather bicycle saddles. Over the last few years I have rekindled my cycling interests and, as this blog shows, I've also started to build vintage bicycles. Steel, leather, and rubber....a fantastic combination of materials that are reminiscent of all vintage bicycle builds. Below are some images of the saddles I have recently fitted to my bikes. A new brown B67 on a 1949 Elswick. A new black B66 on a 1975 Raleigh Sport. A new brown B72 on a 1950's Speedwell. A new brown Brooks Professional on an early 80's 10 speed racer. ....and of course a new Titanium Brooks B17 that came fitted (OEM) to my Pashley Guv'nor, a beautiful saddle. ....and of course the matching saddlebags also look fantastic, Brooks have a complete range of saddlebags that compliment any Brooks saddle. 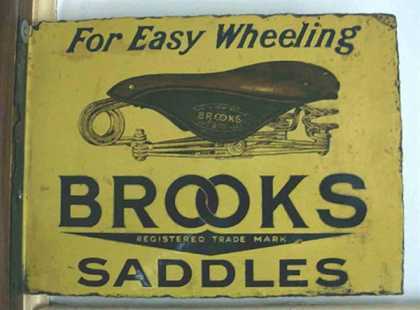 When buying any new Brooks saddle it always pays to get a tin of Brooks proof hide, a waxy paste that is applied to the underside of your new saddle. The proof hide moistens and protects the leather making the saddle more supple and easier to break in. I don't think a vintage rebuild is complete without a Brooks saddle, and I have found that even older used saddles come up a treat after they receive a little care and attention. I am currently building up my 1965 Malvern Star 2 Star and have restored a brown B17 Special for the occasion.....once finished I'll post some images. Before winter each year I give my B17 a coat of Dubbin, then the rest of the year I polish the top with Kiwi boot polish. I've always got both on hand for my hiking boots and it's done the trick for years. (I've been meaning to try the Brooks proofhide, but, I'm a bit disorganised and before I know it Winter's here again and I'm reaching for the Dubbin).